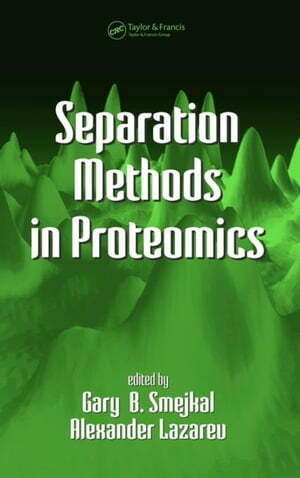 Collins Booksellers - Separation Methods In Proteomics by Smejkal, Gary B., 9781420028058. Buy this book online. Driven by the widespread growth of proteomic practices, protein separation techniques have been refined to minimize variability, optimize particular applications, and adapt to user preferences in the analysis of proteins. Separation Methods in Proteomics provides a comprehensive examination of all major separation techniques for proteomics research. Written as a compilation of hands-on methods exemplified by the work of several recognized leaders in the field, this book may serve as a guide for selection of the optimal separation strategies to solve particular biological problems. Recent progress in the development of robust analytical techniques and instrumentation has created the need for good quality biological samples that are subject to analysis. Emphasizing the importance of sample preparation, the book explains how proteomes can be divided into smaller, less complicated "subproteomes" for individual analysis. It also highlights several hybrid approaches that take into account protein interactions. Including applications of the separation methods currently employed in proteomic analyses for both clinical and basic research, Separation Methods in Proteomics contains practical information that can enhance the current and future endeavors of scientists in proteomics, genomics, transcriptomics, biomarker discovery, and drug discovery.